InflaRx develops highly specific monoclonal antibodies targeting activation products of the complement system. 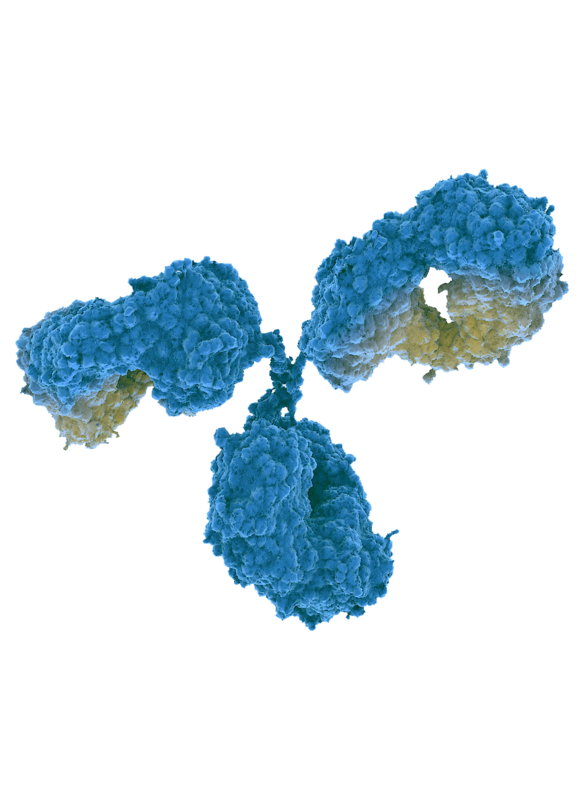 InflaRx has made breakthrough discoveries in the area of anti-C5a antibody generation, resulting in a new class of antibodies with exceptional blocking activities and high selectivity. The InflaRx anti-C5a technology forms the basis for a pipeline of new antibodies to address a broad variety of inflammatory diseases. 1) delivering a complete immunological blockade / inhibition of C5a induced effects - this is important because of the abundant presence and generation capacity of C5a in the human body. Antibodies not achieving this requirement will likely leave a "signaling gap" for C5a, which in any disease setting will cause strong pro-inflammatory effects, thus limiting the ability to silence this signaling axis and to achieve the desired therapeutic result. 2) being fully selective = leaving formation of the membrane attack complex intact - this is important because C5 blocking molecules that block the ability for MAC formation in the blood bear the risk of susceptibility to life threatening infections caused by encapsulated bacteria, such as meningococci and others, for patients being treated with them. The ability to leave MAC formation intact in a highly targeted blocking approach directed against C5a translates into an improved safety profile for the patient. Thus, specificity is an important consideration. 3) binding with high affinity to C5a – this is important because C5a, once generated, is believed to interact rapidly with its receptors which are abundantly present on practically every cell type in the human body and which can even be up-regulated in various disease settings. Thus, a suitable anti-C5a antibody must be capable of limiting such interaction rapidly, capturing C5a before it can interact with its receptors and cause downstream pro-inflammatory signaling effects. 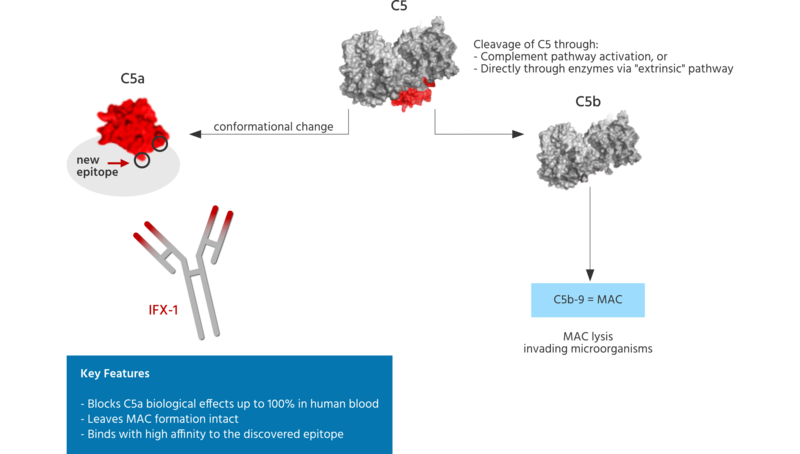 InflaRx's lead drug candidate, IFX-1, is a first-in-class monoclonal antibody targeting the complement activation product C5a and is currently in clinical phase II development. In preclinical studies, proof of concept was demonstrated for the extraordinary anti-inflammatory and tissue saving potential of IFX-1. IFX-1 has been proven safe and well tolerated in a double blind placebo controlled dose escalation Phase I study in healthy human volunteers. In a first clinical phase IIa multi-center placebo-controlled dose escalation study in patients suffering from early septic organ dysfunction, biological proof of concept was established, demonstrating its unique C5a blocking ability as well as selectivity (leaving MAC formation intact). IFX-1 holds large potential for various inflammatory disease indications and is currently being developed in four independent indications. IFX-2 is a follow on project to IFX-1, in preclinical development. IFX-2 is a highly potent anti-complement C5a antibody with a higher humanization grade and altered pharmacokinetic properties. IFX-2 was developed to target chronic inflammatory diseases with high unmet medical need. Recent scientific publications suggest a fundamental role of the complement factor C5a for disturbance of the T-cell homeostasis, thereby contributing to mechanisms involved in chronic and autoimmune inflammatory diseases. Therapies blocking the C5a / C5aR axis are believed to induce regulatory T-cell generation and decrease Th17- and Th1- type responses. Thus, a therapeutic anti-C5a approach would be applicable within a large variety of T-cell driven inflammatory diseases.